- What does a Sunlight Kids lesson look like? One CD-ROM included in Sunlight Kids Kit. These concise, easy-to-use Lesson Guides are the heart of Sunlight Kids, letting you introduce little ones to one major Bible story each month of the year. Each guide provides 5 weeks of lessons so you can switch out activities as desired. Twelve Lesson Guides are included in Sunlight Kids Kit as follows: Jesus and the Sick Boy (January), Jesus Loves Children (February), The Little Boy Who Shared His Lunch (March), Heaven Is a Happy Home (April), Creation (May), Noah and the Ark (June), Baby Moses (July), Samuel Is a Helper (August), God Gives Elijah Food (September), Daniel and the Lions (October), Jonah and the Big Fish (November), Baby Jesus (December). The Bible Visuals are used during Bible Time. They are durable and oversized for more effective use with small children. The monthly Lesson Guides show you a thumbnail of each visual needed during the Bible story. Also included are two Sunlight Kids Posters (11x16): a Welcome poster and a Sunlight Kids Motto poster to decorate your room and welcome your children to Sunlight Kids! One Bible Visuals set included in the Sunlight Kids Kit. Reinforce the Bible story with the simple illustrations and colorful stickers in the Student Activity Book. Use during Table Time for a scribbling good time your little ones will love. And be sure to use the Sunlight Kids Stamp on each child's paper for a perfect finishing touch. • Two pages of stickers to use with some of the Make & Take Crafts and twelve stickers to show completion of the monthly theme. One Student Activity Book included in Sunlight Kids Kit. Note: Order one Student Activity Book per child. Beamer the Duck is the Sunlight Kids mascot. Watch your children's faces light up when Beamer joins them at the end of Bible Time. (No ventriloquism skills required!) Puppet is surface washable and safe for all ages. One Beamer puppet included in Sunlight Kids Kit. Approximately 12" long. The fun songs on the Sunlight Kids Music CD are sure to be a hit with your little ones! Written especially with infants and toddlers in mind and set to familiar children's tunes, these songs are easy to learn and remember. With over 70 songs, the Music CD contains all the songs you need for Sunlight Kids! One CD included in Sunlight Kids Kit. Transport your entire Sunlight Kids ministry in this incredible Portfolio that organizes all the necessities for the whole year. Label each tab according to the month (labels available on Coordinator CD-ROM) and place each month's supplies inside. It's flexible and stretchable enough to hold all your Lesson Guides, Bible Visuals, parent letters, craft supplies, Student Activity Book pages, Nursery Cards, and even extras like t-shirts, the Sunlight Kids Music CD, and more. Sturdy handles let you easily carry it with you. Yellow plastic with black fabric trim. Features Sunlight Kids logo on front. 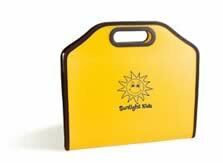 One Portfolio included in Sunlight Kids Kit. 13 1/4 x 12 x 1"
Use this cheerful sun Stamp with the Washable Orange Inkpad for super stamping fun that's a breeze to clean up! One Stamp included in Sunlight Kids Kit. 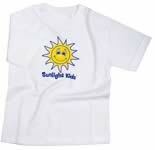 1 x 1 x 1/2"
Make your kids and volunteers feel special with their own Sunlight Kids t-shirts. Shirt is white with the Sunlight Kids logo on front. Sizes 2T, 3T, and Adult S through Adult 4XL. Short-sleeved. One t-shirt (size 2T) included in Sunlight Kids Kit. Informational guide written to parents and their children. Discusses how children can be trained to avoid child and substance abuse and to report it if it's encountered. Check out all the extras!